Wow. This book was so good. It captivated me from beginning to happy ending. 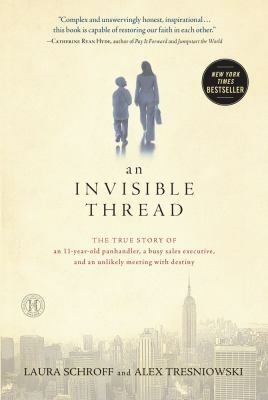 The Invisible Thread is just an amazing true story about a well-to-do career woman and a street kid she meets. He asks her for money and she, like many other New Yorkers, walks on by without actually seeing the boy. Suddenly, in the middle of the street, nearly getting hit by a car, she stops. She turns around, goes back to the boy, asks him if he’s hungry, and takes him to McDonald’s. They spend the afternoon together, just hanging out, and an unlikely friendship is born that spans until today, almost 30 years later. The story of Laura and Maurice is so powerful! Laura chooses to invest her time, money and family in this young street kid. As you can imagine, everyone tries to tell her what an awful idea this is, but she persists. She sees something in him, something special, and her instinct proves correct. She gives him experiences that he had seen on TV but never imagined would actually be for him. He comes from a home life that is foreign and unimaginable to most of us. Laura comes from a very rough background, as well; perhaps that is the basis of her compassion. He says she was his lifeline. She says she has learned much more from him than her learned from her. I say all of us will benefit greatly from reading their story!